The import-export manager performs the tasks of planning and distributing the material on behalf of the company. The major job rules of import-export manager are providing the information on the regulations of customs, managing the import as well as export etc. There can be many reasons for which an import-export manager decides to leave the job. Some people resign because they get the better opportunity while others resign because of not having a proper relationship with the management of the company they are working with. There are some people who are not able to handle the job stress and because of this, they decide not to continue anymore. Resignation letter also acts as a turning point in the life of any professional person because it represents the change or it provides an opportunity to move on. No matter your relationship with your employer is good or not, a professional person will always be concerned about maintaining his honor and dignity by writing a resignation letter. The emotionally charged feelings such as ‘’I feel’’ or ‘’I think’’ should be avoided in the letter. 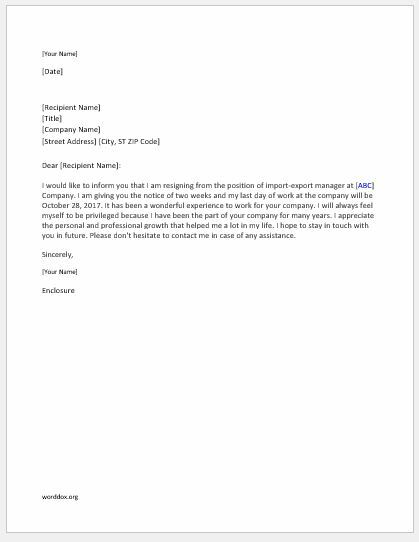 Here is a sample import-export manager resignation letter that is useful for all those people who don’t know much about the structure and format of the resignation letter. I would like to inform you that I am resigning from the position of import-export manager at [ABC] Company. I am giving you the notice of two weeks and my last day of work at the company will be October 28, 2017. It has been a wonderful experience to work for your company. I will always feel myself to be privileged because I have been the part of your company for many years. I appreciate the personal and professional growth that helped me a lot in my life. I hope to stay in touch with you in future. Please don’t hesitate to contact me in case of any assistance.